Carolina Sports Thoughts: How does the Braves move to Cobb County impact regional fans? 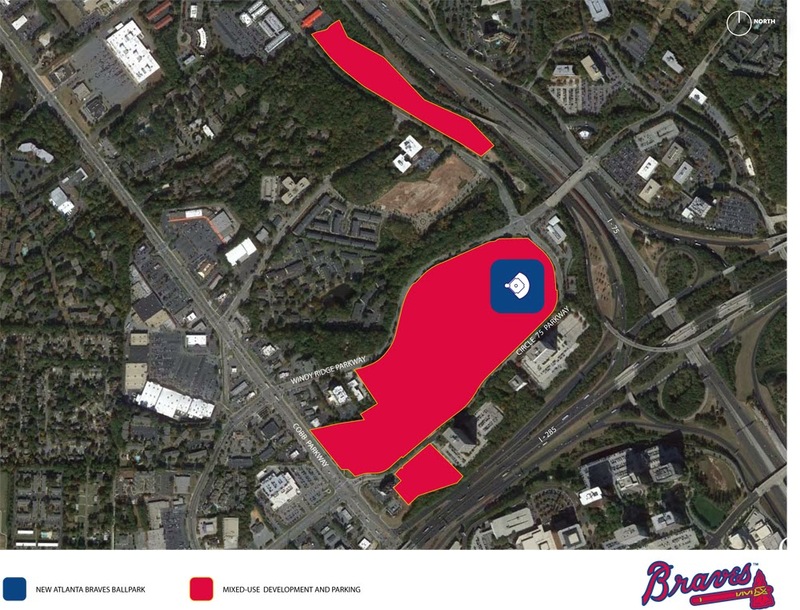 How does the Braves move to Cobb County impact regional fans? The Braves announced today (November 11) that they are building a brand new stadium in Cobb County, NW of downtown Atlanta, to replace Turner Field starting in 2017. The new stadium will be just inside the perimeter, at I-75 and I-285 on the northwest side of town. The new stadium will most likely seat about 41,000. 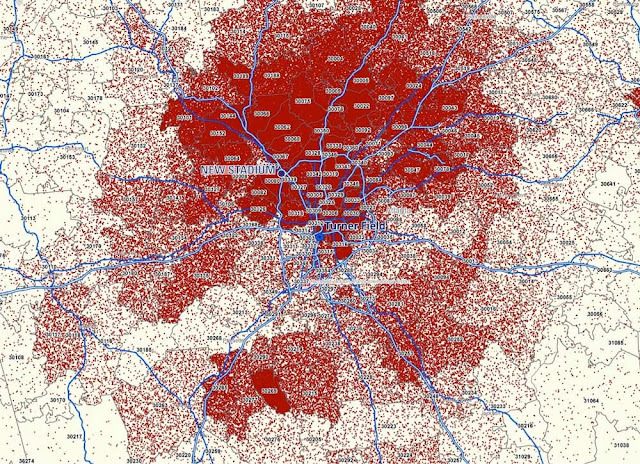 This is where the stadium will be in relation to where Turner Field was in metro Atlanta, with 2012 ticket holders overlayed. Many are complaining about how far the new stadium is from downtown Atlanta. A thing that hasn't really been discussed yet is how the new stadium will impact Braves fans coming from other parts of the Southeast. The Braves have one of the largest fan bases of any team in baseball, and much of it comes from other areas not in the metro area. I will run down major metropolitan areas where the Braves have a lot of fans and compare how it will impact fans. Northwest Georgia: The new stadium is a boon for Braves fans in northwest Georgia. The site of the new stadium is only 58 miles from Rome (where their low-A farm club is), compared to 71 miles from Turner Field. The stadium is 13 miles closer to the northwest Georgia Braves fans, which is important for weeknight Braves games. Dalton is only 77 miles from the new stadium. This will help the Braves in that area. Athens: Many people think that Athens Braves fans will be hurt by the move. In fact, Turner Field and the new stadium are almost the exact same distance from downtown Athens (72.5 to 72.3 miles). You have Perimeter traffic to deal with, but it is a straight shot for fans down 316 to 85 to 285. Some parts of the Athens area are closer to the new stadium. Chattanooga: The new stadium will be a big help for Chattanooga area fans. It will be just over 90 minutes and 13 fewer miles to the new stadium (1:47 to 1:34). With Reds games being televised in Chattanooga, plus a Dodgers farm club, the Braves needed this move to get closer to their fans in that area, where they've been a stronghold since 1966. You also won't have to deal with downtown traffic. Birmingham: For most of the Birmingham area, another major metro area with a lot of Braves fans, it is about 3-5 miles more to go to the new stadium than it is to go to Turner Field. It is not that big of a difference there, but as you get into northeastern Alabama that changes. It will be as much as 15-20 miles closer for places like Guntersville and Fort Payne. It is 3 miles farther from the Tuscaloosa area. Upstate South Carolina: For Braves fans in the Upstate of South Carolina (where they dominate) it is almost the exact same distance that it will be to the new stadium. Instead of going on 85, you'll have to go 285 on the north side of town. Even to Spartanburg and Gaffney, it will be almost the exact same distance. Augusta: A place where the new stadium will hurt is Augusta, long a stronghold of Braves fans. Now it will be 14 miles farther to go to the new stadium than it is to go to Turner Field. It still will be under 2 1/2 hours from most of the area. Macon: It will also be 14 miles farther to the new stadium from the Macon area. It is still a straight shot up I-75 for most of the area though, so there won't be as much of an impact there as the Braves have dominated for generations. Columbus: It will be just 8-10 miles farther to go to the new stadium from metro Columbus. Columbus. It will also be about the same amount farther from the Auburn area. Knoxville: The new stadium is a boost to Knoxville. Now, the area will be 13 miles closer to Major League Baseball. It will now be under a 3 hour drive while you had to drive through the downtown traffic to get to Turner Field, often making commutes long. The Braves and the Reds both have followings in the area. Huntsville: The new stadium will have the same impact on fans in the Huntsville area as it did for Chattanooga. It will be 13 miles closer to the new stadium than it is to Turner Field. Nashville: This is a boost to Middle Tennessee Braves fans (which there are a lot of) but it hurts the cause of Nashville getting a MLB expansion team. The team is 13-15 miles closer to most of Middle Tennessee. Nashville is an area which in the past few years has not been a strong baseball area. The Braves hope that moving closer will provide more attendance for folks from that area. Montgomery: The new stadium will be 9 miles farther away from the Montgomery area than it is now. It is a straight shot up 85 to 285 to go to the new stadium. Columbia: The new stadium will also be 14 miles farther from most of the Columbia area than it is now. Columbia is an area which has long rooted for the Braves. For northern parts of the Columbia metro area (places like Newberry and Chapin) it will be about the same distance to the new stadium as Turner Field. You will have to go through Greenville now. North Carolina: The new stadium is exactly the same distance (246 miles) from Charlotte as it is now. It won't have a large impact on the possibility of Charlotte getting a MLB expansion team down the road. The new stadium is actually a mile closer from Greensboro and Winston-Salem. It is also about the same distance for those from the Asheville area. Charleston: Most Charleston area Braves fans make the long trek to Atlanta for weekend games. It will be 14 miles farther to go to the new Cobb County stadium than it is now. It already is close to a 5 hour drive, but as the Braves have lost a few fans in the past few years (not having a radio affiliate there this year), it will hurt some. Jackson: Jackson, Mississippi, where the Braves double A farm club is (Mississippi Braves) has become a Braves area in the past few years. It is still a very long trek (5 1/2 hours) from the area, but it will only be 3 miles farther with the new stadium. The new stadium is also about 9 miles farther from most Northwest Florida towns, such as Panama City, Fort Walton Beach and Pensacola. Comment here on what you think about the move.